Intex has today expanded its Aqua series portfolio with the launch of Intex Aqua i4+, a dual core budget android phone with dual core processor and various preloaded Apps. In recent couple of months, Intex has been rolling one after another budget smartphone in Indian Market with marginal difference in spec sheet. The pricing of these new Intex budget phones has also been a mystery. The Intex Aqua i4 (Quick Review) with same spec sheet is also selling for around Rs. 8,400. Let’s take a detailed look at this latest offering from Intel. Intex Aqua i4+ comes with a 8 MP shooter at the back supported by LED flash. As far as Megapixel count goes, the camera is above average as most manufacturers will offer you a 5 MP shooter in this price range. A front 1.3 MP camera is also present for video calling. The camera specs are also similar to the predecessor, Intex Aqua i4. The Internal storage is standard 4 GB. Most manufacturers will offer you similar storage option at this price range. You can extend the storage to 32 GB using the MicroSD card. The onboard NAND storage is slightly faster to read and write on than SD card storage and thus we would like the manufacturers to move up from the limited 4 GB storage option. Intex has not yet specified how much of the storage will be available at the user end. The Processor employed is 1.2 GHz Dual core processor similar to Intex Aqua i4. Intel has not specified the chipset details as of now. The RAM capacity backing up the processor is 512 MB. The chipset specs are again very basic. You can expect all general purpose apps to run smoothly but the processor won’t hold water for high end gaming. For a little extra money, you can get several quad core options like Xolo Q1000 Opus and Panasonic T11. The Battery capacity is 2000 mAh and you can extract 6 hours of talk time and 220 hours of standby time from this battery. At almost the same price you can also buy Micromax Canvas Juice, which will offer 10 hours of talk time and 280 hours of standby time from its 3000 mAh battery. The IPS LCD display is 5 inches in size and sports FWVGA, 854 X 480 pixel resolution. The pixel density will be 196 pixels per inches, which implies your text will be soft and not as crisp. The display will be pretty usable. Those interested to indulge in reading and watching videos will appreciate the large size display at this price range. On the software front this phone runs on Android 4.2.2 jelly bean operating system. Intex Aqua i7 comes preloaded with various popular apps like WeChat, OLX app, Intex Play and ‘Matrabhasha’ (an app which helps users access the phone in a language of their choice by supporting 22 regional languages). Intex also provides 5GB of free cloud storage through an Intex Cloud app that makes it easier for users to store more pictures, videos and files. Apart from the spec sheet the looks are quite similar to that of Intex Aqua i4. The phone will be available in Pearl Blue and Pearl White colors. The textured back hasn’t made it to the new version. The phone is not too rounded around the edges. Connectivity features include 3G, HSPA+ and Bluetooth 4.0. This phone will compete against phones like Micromax Canvas Juice, Micromax Canvas Fun A76 and Xolo A500S in the dual core segment. Intex Aqua i4+ will also compete against quad core phones like Gionee Pioneer P3, Xolo Q700, Panasonic T11 and Xolo Q1000 Opus. The Intex Aqua i4 was launched at around 9,400 INR and was overpriced considering the features it offered. The new Intex Aqua i4+ comes at a competitive price of Rs. 7,600 which makes it a viable option for those looking for a 5 inch display below 10 K mark. The Micromax Canvas Juice however seems more impressive on paper with a bigger battery and double the amount of RAM. Intex Aqua i4+: Beware of false claim on the company’s website. 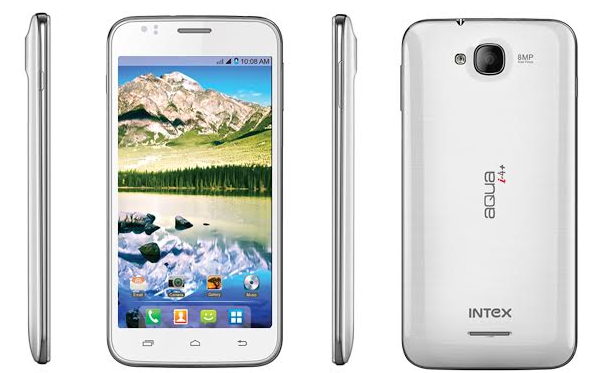 The official website of the company (http://intexmobile.in) list down the specification of this phone which has AGPS. I bought this phone last week, just to discover that I have been deceived with the wrong information present in the website. The phone doesn’t have any AGPS hardware (Navigation won’t work). Thanks to the local retailer who sold me this phone. He did understand the pain and agreed to take back the phone (I deducted a minimal amount for a week’s usage). I bought a Micromax phone and I am happy now. Intex has the worst customer support I have ever seen. Emails will never be responded. I called customer support to tell them that AGPS hardware is not present in the handset (as said in their website). The solution provided to me was to download Google Maps from the Play Store. Wow! !